COSATU (the Congress of South African Trade Unions) was born in 1985 at the height of the struggle against apartheid. It inherited the legacy of the 1973 Durban strikes, which generated new traditions of effective worker control, coupled with militancy on the ground. This signalled a renewed form of worker movement, driven by workers’ deep desire to own and control their organisations democratically. This type of worker movement effectively raised workers’ issues at the workplace and in communities, to unite different strands and movements of the working class into a broad struggle against apartheid. The traditions and organisation of the various unions that merged into COSATU were differently shaped by history. Some were products of FOSATU (Federation of South African Trade Unions), which revived unionism in the belly of the beast, inside the country against racist employers and their racist state; others of SACTU (South African Congress of Trade Unions) from the Congress movement, which primarily aimed at the apartheid state and all its racist institutions. These were the primary orientations of the different unions that formed COSATU. COSATU was formed to bring all workers together under one umbrella. A protracted negotiations process, lasting no less than four years, resulted in 500 000 workers coming together under the new giant’s umbrella in December 1985. However unity has often been elusive. Some unions, for political or organisational reasons, chose to remain outside the new umbrella. A key and abiding reason for the formation of COSATU is: ‘One union, one industry – one country, one federation’. This was meant to unite all the unions in each sector and industry to face employers and bargain effectively. In the same vein, workers uniting under one national umbrella would raise their bargaining capacity. But some unions, even within the COSATU family, have always, for one reason or the other, evaded the ‘one union, one industry’ principal to encroach into the scope of other unions – sometimes called cannibalising – thus creating friction amongst affiliates of COSATU. This proved very divisive, threatening the unity and cohesion of the federation. Several attempts to make unions talk amongst themselves and agree to hand back these workers worked in some instances, but not in others. 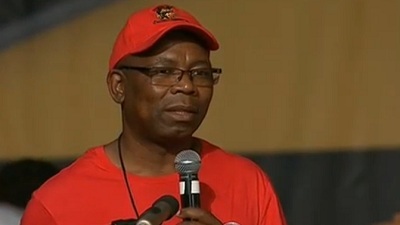 The main turn of events was when NUMSA (National Union of Metalworkers of South Africa), at its Special National Congress in 2015, took a decision against the key founding principle of the federation when they resolved to organise beyond their set scope by becoming a general union, thus cannibalising on the other unions. It is not possible to unite workers on the basis of such an approach. Hence COSATU made the most painful decision in its whole history, to effectively expel its biggest affiliate for threatening the unity of the federation. This was after several meetings, engagements, mediations and political pleas by the federation and allied progressive organisations. COSATU insists that it is still prepared to re-engage with NUMSA, and any other worker formation, from a platform based on the unity of workers as in our founding principle, which is the most possible means to unite wider layers of workers to fight towards one common struggle – the struggle against capitalism. The destructive effects of neo-liberalism in the lives of working people and poor communities. South Africa has relatively low levels of unionisation. Only 30% of the whole work force is unionised. This makes the competition for members very intense. It takes varying forms, some honest and others bordering on dirty tricks and misinformation against other workers and movements. The terrain upon which workers are waging a political-economy struggle has changed since 1994 and before. The global economy is in far deeper crisis than before, and it transfers all the burdens to the poor and working people, particularly in the developing countries. This makes most of our struggles defensive of the little gains we have made or, at worst, collaborative to save jobs in certain sectors. But this doesn’t mean our militancy or decisiveness in defence of workers and their families has diminished. It is also true that we are in alliance with a ruling Party, the ANC, which led the liberation movement that defeated apartheid and heralded a new and democratic society. This is not without its contradictions as we are the first to admit and always have. But key to us is the frontline defence of workers’ class interests in all our engagements. The South African political economy is itself growing far less than required to create jobs and expand national wealth. And inequality has become the single biggest threat to global peace and stability – if there was any. These features play out in the pressure on the trade union movement to defend its members, win new territories, advance social justice, and rebuild momentum that creates a bigger share of income for workers and their families. The crisis facing the African economy also weighs on the South African economy and vice versa. This moment of generalised and deepening crisis requires new ways of organising and building new and effective class alliances around issues of common interest that unite workers, communities and all who suffer the effects of neo-liberal globalisation. 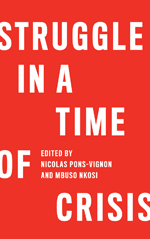 We are intensely engaged in deep and protracted struggles against a ‘triple crisis’: unemployment, poverty and inequality. These result from the legacy of apartheid and the neo-liberal restructuring of the economy. We still face the apartheid wage gap, which structures the labour market into racial, gendered, rural, low skilled, informal and vulnerable, migrant and other peripheral sectors of the economy who suffer the triple crisis of the economic crisis. COSATU has led, for many years, a social wage struggle, linked to the demand for comprehensive social security. Comprehensive social security in general, including all other key essentials for a decent life for all workers. Another critical issue facing workers in our country is collective bargaining, which is under serious strain. Capital is trying all manoeuvres possible to weaken, fragment and disorganise the bargaining system, which workers fought for years to build. The fragmentation or proliferation of workers and unions which we talked about also strengthens the arrogance of employers. In some cases, we have lost centralised bargaining to a very fragmented bargaining arrangement that is in some cases manipulated by employers at will. The right to strike is under serious attack in various ways, just as, globally, is demonstrated by the ILO often enough these days – by limiting it, making it impossible, making it a tedious and laborious process, dividing workers on some issue of divergent or potentially conflicting interests, as well as stratifying workers to divide and rule. Outsourcing, casualisation, informalisation and other forms of neo-liberal peripheralisation of workers compound the problem further. There could be five different employers in one company, dividing and weakening workers’ bargaining power. While the right to strike is in the constitution of the country, it has been eroded and weakened to have less and less effect. Blackmail, particularly in an era of massive joblessness, is a serious threat. In the same way that capital often sets workers against each other according to nationality, leading to explosive xenophobic tensions, largely in farms, retail sector, hospitality and security industry.